The first time I heard of the Klon Centaur was when I saw one on eBay for over $2000. The thought of a single guitar pedal costing that much money seemed insane. After a bit of research, I found that the history of the Klon Centaur is just as insane as the price they sell for. 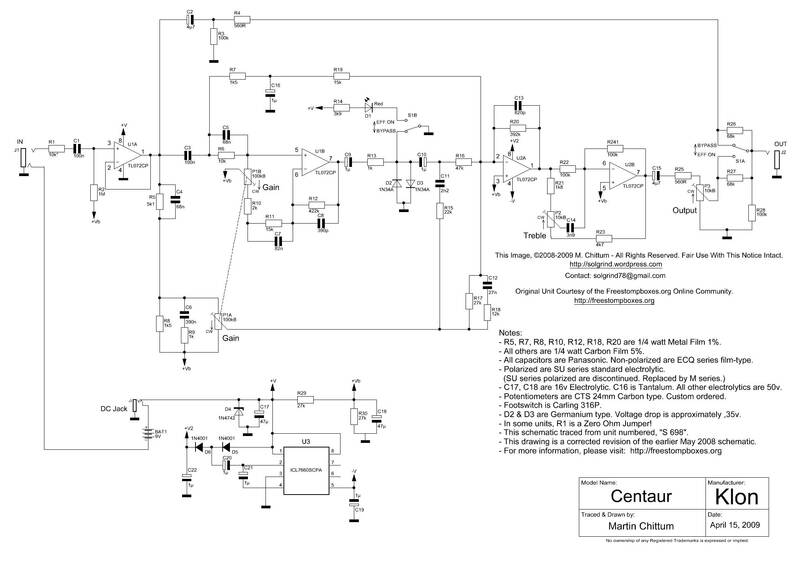 In this guide, I’ll explain everything you might want to know about the Klon Centaur. Find out about the Centaur’s history, how it compares to other pedals, why there are so many clones of the Centaur, and how you can build your own exact Klon clone from either the schematics or a diy kit. At the end of this guide, I compare the different options you have available to get the iconic Klon Centaur sound on your pedalboard. What Makes The Klon Centaur So Good? The Klon Centaur is an overdrive pedal created in the early 90s by Bill Finnegan. It was designed by Bill and some MIT engineers between 1990 and 1994. 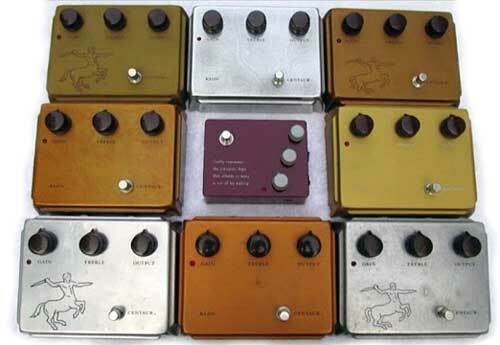 About 8000 Klon Centaur pedals were built between 1994 and 2000. The main reason why the Klon Centaur is so popular is due to hype. While the Klon Centaur is a great pedal, it’s the hype and the fact that the original pedals are no longer made that makes people pay crazy money for one. While there are guitarists out there that will swear it’s the best pedal in existence, many guitarists don’t see what the fuss is about when they try one. Have a listen to the comparisons of the original Klon Centaur and some cheaper clones to make your own mind up on this pedal. It’s important to note that whether it’s a gold or silver pedal, the internal circuits are the same across all Klon Centaurs. The only time there was a change in the circuit was in 1994-1995 where a couple of minor components were changed. Explaining how the hype behind this pedal built up explains why it’s so sought after. While we’re used to seeing expensive boutique pedals today, the Klon Centaur was one of the first boutique pedals to come out. Transparent overdrive pedals like the Klon Centaur can be very effective in adding sparkle and character to your tone. When famous guitarists such as Jeff Beck started using a Centaur, word started to spread. When the Centaur was discontinued in 2000, the hype started to take off. Prices for second-hand pedals started to climb to insane levels. To build a true clone of the Centaur, you need to replicate the circuit. With classic pedals such as the Tubescreamer, this was an easy job. All somebody needed to do was buy a Tubescreamer and they could take a look at the internal circuit. This black goop is a resin that encases the components to hide the component types and circuit path. It’s a common technique used to hide trade secrets and prevent copying. Hiding the circuit and components in resin was a smart way to prevent early copies and added significantly to the Centaur’s hype. Hiding the circuit meant people could only speculate what they thought might be under the black goop. It added to the mystery of the Centaur and no doubt made Klon a lot of money. The exact circuit of the Centaur wasn’t known until 2009. That’s a long time of mystery to build up hype. In 2009 the community at freestompboxes.org bought a Centaur and sent it to Martin Chittum to analyze. Martin was able to remove the goop to trace the circuit and identify all of the components. There’s a great analysis on the circuit design at the Coda-Effects site, so if you’re interested in the details behind this design, check the article out. In any discussion about Klon clones or DIY kits, you’ll see a discussion over diodes. While the mystery behind the Centaur’s schematic was solved in 2009, one element remained unknown: the exact type of diodes used. Diodes play an important role in drive pedals. There’s a big difference between a fuzz pedal using a germanium diode and one using a silicon diode. As Martin Chittum was unable to identify the type of Diode in his Centaur, some mystery remained. A lot of DIY pedal-makers experimented with different types of diodes and many found that D9E diodes were a perfect sonic match. Well, Bill Finnegan himself has noted in a forum post that the only diodes he ever used were Russian-made diodes with part number 1N34A and these diodes were produced by many different companies. Bill states that they all sound somewhat different, so even if the exact type of diodes were used in a clone, results may vary. The point to take away here is that there aren’t any “magic diodes” in a Klon pedal that are missing in clones. If you lined up 10 Klons and 10 clones and tried to sort them out by ear, you might hear some variability between pedals, but I doubt anybody could correctly sort the pedals out. When a guitar pedal starts to develop a large following, clones start appearing. Many boutique pedal companies started out by producing modified clones of popular pedals such as the Tubescreamer. While there are countless Klon clones available today, a true clone wasn’t available until after 2009. As explained above, in 2009 Martin Chittum de-gooped a Centaur and released the exact schematics. The massive hype, insane second-hand prices, and mystery made the Klon Centaur a perfect target for clones. Boutique pedal companies rushed out to produce their own clones of the Centaur to cash-in on its success. Today you can find countless pedals that are either exact replicas of the Centaur or “heavily inspired by” the Centaur. Some stay true to the form of the Centaur, while others give you the same circuit in a compact enclosure. 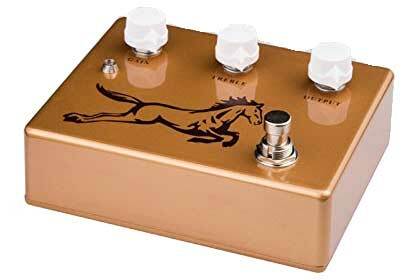 This KLONE from TTONE gives you the classic Centaur pedal style with a similar gold finish and horse on the front. It gives you the same three knob control as the original and can be run off of a 9V battery or external power. If you’re looking for a Klon Centaur clone and want to keep the same look and features as the original, this is as close as it gets. It comes at a surprisingly low price considering how much other clones cost. At around the same price as the EHX Soul Food (covered later), it’s a very affordable pedal. Check out the price and details of the TTONE New KLONE here. This clone takes the classic circuit and packs it into a smaller pedal enclosure. 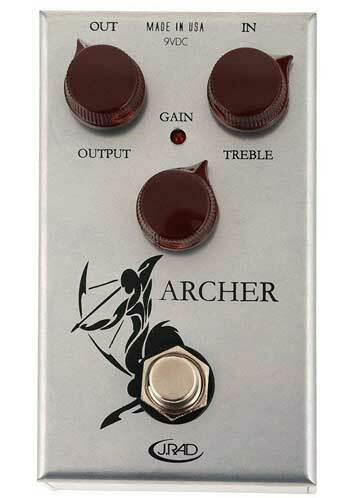 You get the standard three knobs to control the effect and an archer design on the front is clearly a take-off of the Centaur’s design. This clone does come at a much higher price as the other clones mentioned here, but it’s still far cheaper than the Klon KTR (covered below). Some people who have compared the original Centaur and the Archer actually prefer the Archer. When listening to the two pedals, keep in mind that one costs well over ten times the other. 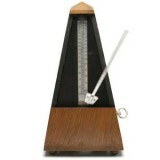 Do you really hear a difference in tone that is worth $2000+? Check out the price and details of the J Rockett Archer here. The Wampler Tumnus is a super-compact clone that gives you the same circuit and features as the Centaur in a tiny enclosure. It isn’t as obvious about being a clone as others, but the signs are still there: the gold finish, an outlined mythical creature on the front, and the three knobs. A compact pedal like the Tumnus is a great option for guitarists looking for a simple pedal to use as an overdrive boost. You can easily add a pedal like this onto your pedalboard without it taking up much room. The Tumnus is in the mid-range in terms of prices of Centaur clones. It’s far cheaper than the Archer, but more than double the price of the TTONE KLONE. The only downside of the compact pedal size is that it cannot be powered with a battery. Check out the price and details of the Wampler Tumnus here. After the Centaur was discontinued in 2000, the hype and price of second-hand Centaurs exploded. They became a sought-after collectible and if you search on eBay for an original, you can expect extreme prices. The Klon KTR uses the same circuit as the Centaur. The main difference is that smaller surface-mounted components were used so the entire circuit could fit into a smaller pedal enclosure. While that message might sound like Bill is trying to put the hype and mystery behind the Centaur to rest, I feel it does the opposite. 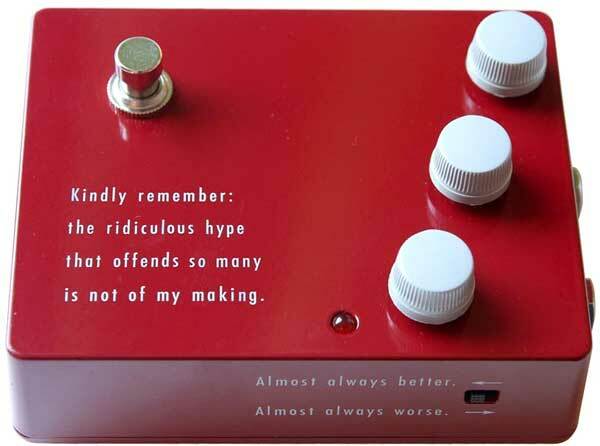 The message reinforces the hype by constantly reminding you of it every time you look at the pedal. There’s no black goop on the electronics this time, but by 2014 there was already a flood of Centaur clones available. The hype behind the Centaur was so high that Bill didn’t need to try and hide anything. The KTR sells for a seriously high price today thanks to the ‘ridiculous hype’ of the Centaur. The EHX Soul Food became an instant hit as it was “heavily inspired” by the Klon Centaur. It’s a clone in a compact pedal enclosure. The Soul Food gives you the same three knob control as the original, but unlike other clones, it doesn’t blatantly look like one. I go into detail on the Soul Food in my review here, so check it out for full details. I was quite surprised when watching the above video. If you close your eyes while listening, at times it’s extremely difficult to tell when the pedals have switched. The Soul Food adds an extra feature not found on the Klon Centaur or other clones: True Bypass. You’re able to choose whether you want to use a buffered bypass like the Centaur, or True Bypass. If you like the idea of having a Klon clone on your rig but don’t want another buffer, the Soul Food is a great option. Check out the price and details of the Soul Food here. It’s also worth mentioning that a very popular mod of the Soul Food is available by JHS Pedals. JHS take a Soul Food and add a three-way toggle switch and an extra control knob to give you a bit more flexibility over the pedal. The three-way toggle switch allows you to choose from three different clipping settings. The three options are: stock EHX clipping, open clipping, and true Klon style germanium clipping. The extra control knob is a bass contour “Meat” knob that allows you to shape the tone in a different way. As you might expect, this modded pedal comes at a much higher price compared to the original EHX Soul Food. Check out the price and details of the JHS Pedals EHX Soul Food Meat & 3 pedal here. While there are plenty of cheap clones you could buy, you may prefer building your own Klon Centaur clone. 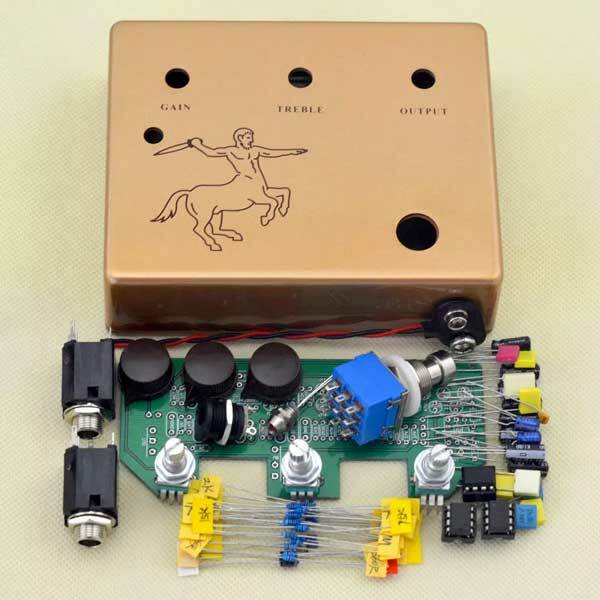 For less than 10% of the price of a Klon KTR, you can build your own Centaur replica from a kit. Building a kit is a great way to get the classic Klon Centaur sound while trying something new. It’s not hard to put a pedal kit together and you’ll probably enjoy building it. There are a lot of Klon Centaur clone kits available that fit into different pedal enclosures. Some kits will fit into compact pedal enclosures, while others are designed to give you the exact size and style of the actual Centaur. If you buy a kit on Amazon or eBay, I recommend first asking whether it comes with instructions. If you’re not used to building electronics projects, a good set of instructions is crucial to getting your pedal set up properly. One interesting thing I noticed when reading reviews of DIY clone kits, is that everybody who makes their own clones seems to prefer the sound of their pedals when they compare it to bought pedals such as the Soul Food. A lot of people say they were unimpressed with the sound of a bought clone, but when they finished building their own clone, they were suddenly super-impressed. My guess is that these people are subconsciously rating their own clones higher. It’s just like when people say they can cook a better steak compared to a restaurant-bought one cooked by a professional chef with decades of practice. 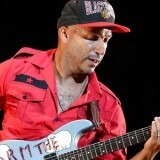 Don’t underestimate how much we as guitarists trick ourselves when it comes to tone! 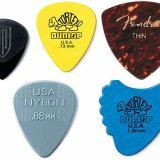 The guitar, amp, and pedal industry is built around subjectivity. Who should buy a Klon Centaur kit: if you’re interested in modding your pedals, learning about electronics, or building your own pedals, I highly recommend getting a kit. It’s a cheap and easy way to learn about the basics of electronics and in the end, you’ll have a great clone of an iconic effect. Learning how to solder components to a PCB and wire up your Klon Centaur clone kit will teach you excellent skills for the future. If you ever decide to upgrade your pickups or install a push-pull pot on your guitar, you’ll have the soldering skills ready to go. There are plenty of kits available on sites like eBay, Amazon, or Alibaba, so if you’re interested in building your own pedal, have a look around to find a kit that suits you. The Klon Centaur (and all its clones) is a transparent overdrive. “Transparent” means that it doesn’t change the color of your tone. In other words, when you turn the pedal on, it won’t sound like a different guitar tone. It will sound like the same tone, but enhanced in certain ways. The most popular way to use a Klon Centaur is as a clean booster. A booster adds some extra oomph to your signal to push your amp a little harder. This is how tube amps can produce the warmth that makes them so popular. Set up a clean tone on your amp and experiment with the pedal. Start off with a low drive level, then gradually build the gain up as you play. You’ll learn how the pedal changes as you add in more gain. 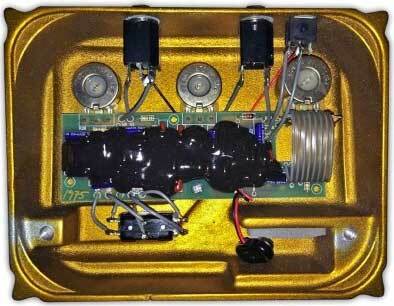 If you have a tube amp, you’ll be able to hear how the pedal begins to push your amp at a certain stage. Set your amp to the point where it’s on the verge of breaking up, then use the pedal to push the amp into overdrive. This is the most common way of using a transparent overdrive pedal. Another way people use a Klon Centaur is to stack it with other drive pedals. You can use a pedal (or your amp) to produce your main drive tone, then you can add in the Centaur when you want your tone to have a bit more sparkle or boost. The most common use is for lead sections. 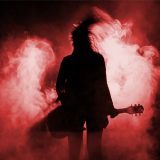 To learn how to set up different tones and stack drive pedals together, check out my Guitar Effects Course. You’ll learn the difference between overdrive and distortion, how to combine different pedals and how to set up different tones on your rig. What makes the Klon Centaur so valuable? The current price of the original Klon Centaur pedals is due to two factors. First, the pedals are discontinued, so it’s now a collectible. Whenever you stop supplying something that is in demand, the price goes up. The second reason for the high price is due to the hype around this pedal. Think of the Bitcoin craze at around 2017-2018. At that time, the price of Bitcoin skyrocketed to insane levels. Those high prices were mainly due to the hype. It’s the same with the price of Klon Centaur pedals. When people see a Centaur sell for $2500 on eBay, it reinforces the idea that the pedals must be amazing. While the Bitcoin hype train eventually crashed, the Klon hype train still powers on (for now). How many Klon Centaurs were made? Around 8000 Klon Centaurs were made from 1994 to 2000. Each pedal was hand wired by Bill Finnegan. Does the Klon Centaur really sound better than the Klon KTR? A circuit is a circuit. The Klon KTR takes the exact same circuit from the Klon Centaur and squeezes it into a smaller pedal enclosure using surface mount components. It’s the same circuit so it sounds the same. When people say their Centaur sounds better than the KTR (or a clone), it’s an example of how hype and emotions can trick us. Spending $2000+ on a pedal can easily sway people into hearing differences that don’t exist. What was the original price for the Klon Centaur? The original Klon Centaur cost $225 when it came out. The extreme prices you see today are a result of hype and the fact that the pedals are discontinued.